wear……Easy to wear without damaging your natural hair! No clips, no glue, no weaving, flip hair extension In is the damage-free way to wear extensions. An instant, temporary hair extension, secured by an invisible wire, it adds length and volume, is easy to use. 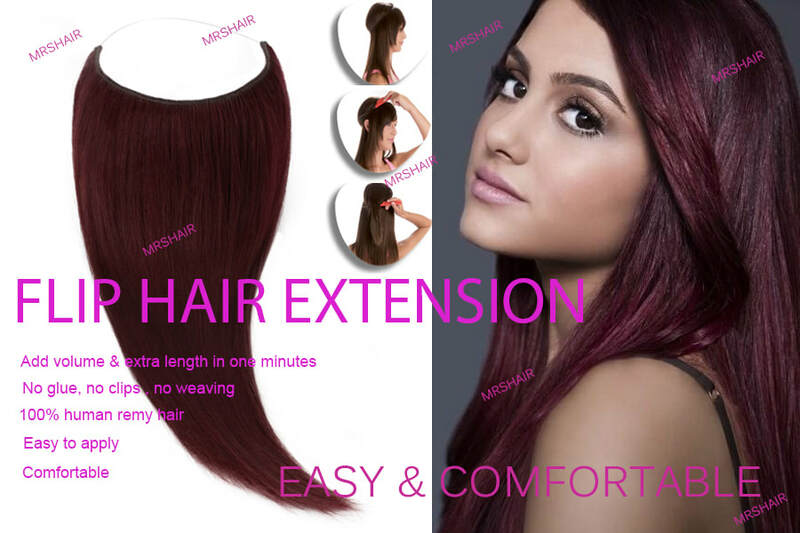 The great advantage with flip hair extension that unlike traditional hair extension systems, you do not need to spend hours having your new hair fitted. Flip- hair In takes less than one minute to fit and literally one second to remove. Now worn by thousands of women around the world, flip hair is a brilliant hair extension piece which offers an innovative alternative to achieving longer, thicker hair in minutes-without damaging the hair in any way. Forget traditional hair extension methods of gluing, clipping and weaving-secret flip hair is a temporary, instant hair extension which simply sits on your head and stays perfectly in place thanks to an undetectable, transparent wire which is hidden by your own hair. from there. Easy and simple to use, it takes literally one minute to fit and only one second to remove. It is hassle-free and looks completely natural. In order to achieve the most natural looking hairstyle possible, the quality of our hair is paramount. We only use the finest quality 100% human hair available, which blends perfectly with natural hair. Because Flip wire hair is made from human hair, it means you can treat it just like your own. Using hairdryers, irons, tongs and clips is absolutely fine, and you can brush, wash and style it as you would your own hair. Weft width: 12”(30cm)-13" , or as customer's request .